Kirk Nesset’s Saint X chronicles the muted millennial age. Full of peculiar, recognizable figures, Nesset’s collection is a character filled book—people who wear bandages rather than smiles, misshapen champions downed by self-bludgeons. For example, “Your Own Master,” chronicles a female speaker airing her grievances who ends up rewarded with a pelting of fresh tomato. “Some Of The Most Striking Women I Have Known Have Been Men” uses the occasion of conferencing transsexuals and drag queens to discuss praising difference like saluting a banner. and limpet, this cryptic rabble of pebbles. Attempting to make the undetectable portions or our world visible is often not easy, but to take on two invisible subjects, microbes and ideas, in a single short poem is quite ambitious. This ambition is visible in a few other poems within the collection as well. Mostly, however, the poems in Saint X lack this. For example, “Café Perpendicular,” which paints the quintessential wine flavored kiss in the rain, brings Nesset’s perspective to the familiar scenario succinctly but brings nothing new to the cliché. The “thing” of the poem is never illuminated. Its description is clever throughout the stanzas and the poem overall is strong. 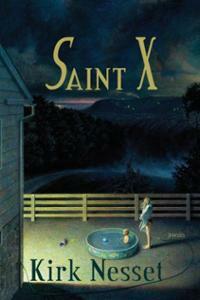 Saint X is in no way a perfect collection and overall this reader left disappointed. That being said, there are a few strong pieces within the collection that I thought were well written and fun to read. Shauna Osborn is a Comanche/German mestiza who works as an instructor, wordsmith,and community organizer in Albuquerque, New Mexico. She received her Master of Fine Arts from New Mexico State University in 2005. Shauna has won various awards for her academic research, photography, and poetry. Her first collection of creative nonfiction is currently being considered for publication.